Click here to visit the ID facebook and like them. Then on the “Tumbler Giveaway” tab, scroll down and click “Enter Now” towards the bottom. 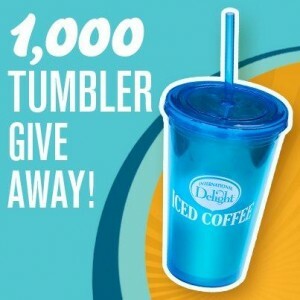 Then fill out the form on the next page to enter to win 1 of 1,000 tumblers. You can enter daily until 10/1 and they’ll notify you by email if you’re a winner. Good luck all! Me too. Are they trying to make us jump through hoops or what? I love coffee hot and cold! I’ve been trying since midnight. Now, the instructions are finally posted, but when I click on “Click here”, it takes me to some site having nothing to do with the giveaway. Is this some type of IQ test or what? Why not make it simple for a person to get a gift? Love to win something off these freebies!!!! International Delight is my favorite iced coffee. Yummy!!! love to have a tumbler love international delight coffee creamer use it all the time YOU ROCK!!! Iced coffee is the best in the morning and afternoon. i love getting freebies in the mail. thank you. I love trying new products. If they are better then what I use I will make a switch but I am hard to please so change is hard for me. these are awesome! Hope I win one!